A sugar beet is a plant whose root contains a high concentration of sucrose and which is grown commercially for sugar production. In plant breeding it is known as the Altissima cultivar group of the common beet (Beta vulgaris). Together with other beet cultivars, such as beetroot and chard, it belongs to the subspecies Beta vulgaris subsp. vulgaris. Its closest wild relative is the sea beet (Beta vulgaris subsp. maritima). In 2013, Russia, France, the United States, Germany, and Turkey were the world's five largest sugar beet producers. In 2010–2011, North America and Europe did not produce enough sugar from sugar beets to meet overall demand for sugar and were all net importers of sugar. The US harvested 1,004,600 acres (406,547 ha) of sugar beets in 2008. In 2009, sugar beets accounted for 20% of the world's sugar production. The root of the beet contains 75% water, about 20% sugar, and 5% pulp. The exact sugar content can vary between 12% and 21% sugar, depending on the cultivar and growing conditions. Sugar is the primary value of sugar beet as a cash crop. The pulp, insoluble in water and mainly composed of cellulose, hemicellulose, lignin, and pectin, is used in animal feed. The byproducts of the sugar beet crop, such as pulp and molasses, add another 10% to the value of the harvest. Sugar beets grow exclusively in the temperate zone, in contrast to sugarcane, which grows exclusively in the tropical and subtropical zones. The average weight of sugar beet ranges between 0.5 and 1 kg (1.1 and 2.2 lb). Sugar beet foliage has a rich, brilliant green color and grows to a height of about 35 cm (14 in). The leaves are numerous and broad and grow in a tuft from the crown of the beet, which is usually level with or just above the ground surface. 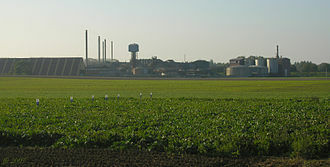 Modern sugar beets date back to mid-18th century Silesia where the king of Prussia subsidised experiments aimed at processes for sugar extraction. In 1747, Andreas Marggraf isolated sugar from beetroots and found them at concentrations of 1.3–1.6%. He also demonstrated that sugar could be extracted from beets that was identical with sugar produced from sugarcane. His student, Franz Karl Achard, evaluated 23 varieties of mangelwurzel for sugar content and selected a local strain from Halberstadt in modern-day Saxony-Anhalt, Germany. Moritz Baron von Koppy and his son further selected from this strain for white, conical tubers. The selection was named weiße schlesische Zuckerrübe, meaning white Silesian sugar beet, and boasted about a 6% sugar content. This selection is the progenitor of all modern sugar beets. A royal decree led to the first factory devoted to sugar extraction from beetroots being opened in Kunern, Silesia (now Konary, Poland) in 1801. The Silesian sugar beet was soon introduced to France, where Napoleon opened schools specifically for studying the plant. He also ordered that 28,000 hectares (69,000 acres) be devoted to growing the new sugar beet. This was in response to British blockades of cane sugar during the Napoleonic Wars, which ultimately stimulated the rapid growth of a European sugar beet industry. By 1840, about 5% of the world's sugar was derived from sugar beets, and by 1880, this number had risen more than tenfold to over 50%. The sugar beet was introduced to North America after 1830, with the first commercial production starting in 1879 at a farm in Alvarado, California. The sugar beet was also introduced to Chile by German settlers around 1850. "The beet-root, when being boiled, yields a juice similar to syrup of sugar, which is beautiful to look at on account of its vermilion color" (1575). This was written by 16th-century scientist, Olivier de Serres, who discovered a process for preparing sugar syrup from the common red beet. However, because crystallized cane sugar was already available and provided a better taste, this process never caught on. This story characterizes the history of the sugar beet. The competition between beet sugar and sugarcane for control of the sugar market plays out from the first extraction of a sugar syrup from a garden beet into the modern day. The use of sugar beets for the extraction of crystallized sugar dates to 1747, when Andreas Sigismund Marggraf, professor of physics in the Academy of Science of Berlin, discovered the existence of a sugar in vegetables similar in its properties to that obtained from sugarcane. He found the best of these vegetable sources for the extraction of sugar was the white beet. Despite Marggraf’s success in isolating pure sugar from beets, their commercial manufacture for sugar did not take off until the early 19th century. Marggraf's student and successor Franz Karl Achard began selectively breeding sugar beet from the 'White Silesian' fodder beet in 1784. By the beginning of the 19th century, his beet was about 5–6% sucrose by (dry) weight, compared to around 20% in modern varieties. Under the patronage of Frederick William III of Prussia, he opened the world's first beet sugar factory in 1801, at Cunern (Polish: Konary) in Silesia. The work of Achard soon attracted the attention of Napoleon Bonaparte, who appointed a commission of scientists to go to Silesia to investigate Achard's factory. Upon their return, two small factories were constructed near Paris. Although these factories were not altogether a success, the results attained greatly interested Napoleon. Thus, when two events, the blockade of Europe by the British Navy and the Haitian Revolution, made the importation of cane sugar untenable, Napoleon seized the opportunity offered by beet sugar to address the shortage. In 1811, Napoleon issued a decree appropriating one million francs for the establishment of sugar schools, and compelling the farmers to plant a large acreage to sugar beets the following year. He also prohibited the further importation of sugar from the Caribbean effective in 1813. The number of mills increased considerably during the 1820s and 1830s, reaching a peak of 543 in 1837. The number was down to 382 in 1842, producing about 22.5 million kg of sugar during that year. As a result of the French advances in sugar beet production and processing made during the Napoleonic Wars, the beet sugar industry in Europe developed rapidly. A new tax levied in Germany in 1810 prompted the experimentation to increase the sugar content of the beet. This was because the tax assessed the value of the sugar beet crop based on the unprocessed weight of the sugar beet rather than the refined sugar produced from them. By 1812, Frenchman Jean-Baptiste Quéruel, working for the industrialist Benjamin Delessert, devised a process of sugar extraction suitable for industrial application. By 1837, France had become the largest sugar beet producer in the world, a position it continued to hold in the world even into 2010. By 1837, 542 factories in France were producing 35,000 tonnes of sugar. However, by 1880, Germany became the largest producer of sugar from sugar beet in the world, since the German factories processed most of the sugar beets grown in eastern France. By the 1850s, sugar beet production had reached Russia and Ukraine. This was made possible by the protection of the sugar beet industry by bounties, or subsidies, paid to beet sugar producers upon the export of their sugar by their respective governments. The protection provided to the sugar beet industry by these bounties caused drastic damage to the cane sugar industry and their grip on the British sugar market. The result was a reduction in the production of cane sugar, molasses and rum until 1915. During World War I, the widespread conflict destroyed large tracts of land that had served as sugar beet producers and repurposed much of the remaining sugar beet land for grain production. This resulted in a shortage that revived the shrinking cane sugar industry. The first attempts at sugar beet cultivation were pursued by abolitionists in New England. The "Beet Sugar Society of Philadelphia" was founded in 1836 and promoted home-produced beet sugar as an alternative to the slave-produced cane sugar from the West Indies or sugar imported from Asia (called "free sugar" because it was grown without using slavery), but which tasted "awful". However, this movement failed, perhaps most due to the unpopularity of abolitionists at the time, at least until the Civil War, when these associations would become irrelevant and only the economic feasibility of the industry remained. In the 1850s, an attempt was made in Utah by the LDS Church-owned Deseret Manufacturing Company to grow and process sugar beets, that failed for several reasons. First, the beet seeds they imported from France were not able to produce much sugar in the heavily salinized soil of Utah. Second, the cost of importing the beet seed from France ate up any possibility for profit. Finally, none of the people running the factory knew how to properly use the chemicals to separate the sugar from the beet pulp. The first successful sugar beet factory was built by E. H. Dyer at Alvarado, California (now Union City), in 1870, but did not see any profit until 1879. The factory survived on subsidies it gained, since the abolitionist stigma that had held back the development of a sugar beet industry had been erased with the Civil War. After this first success in Alvarado, the sugar beet industry expanded rapidly. In 1889, Arthur Stayner and others were able to convince LDS Church leaders to back a second attempt, leading to the Utah-Idaho Sugar Company. By 1914, the sugar beet industry in the United States matched the production of its European counterparts. The largest producers of beet sugar in the United States would remain California, Utah, and Nebraska until the outbreak of World War II. Many sugar beet farmers in California were Japanese Americans; when they were interned during World War II, California's beet sugar production also shifted inland to states such as Idaho, Montana, North Dakota, and Utah. In many of the regions where new sugar beet farms were started during the war, farmers were unfamiliar with beet sugar cultivation, so they hired Japanese workers from internment camps who were familiar with sugar beet production to work on the farms. Sugar beets are grown in 11 states and represent 55% of the US sugar production as compared to sugar cane which is grown in 4 states and accounts for 45% of US sugar production. Sugar beets were not grown on a large scale in the United Kingdom until the mid-1920s, when 17 processing factories were built, following war-time shortages of imported cane sugar. Before World War I, with its far-flung empire, the United Kingdom simply imported the sugar from the cheapest market. However, World War I had created a shortage in sugar, prompting the development of a domestic market. The first sugar beet processing factory was built at Lavenham in Suffolk in 1860, but failed after a few years without the government support its counterparts on the continent received. The Dutch built the first successful factory at Cantley in Norfolk in 1912, and it was moderately successful since, because of its Dutch backing, it received Dutch bounties. Sugar beet seed from France was listed in the annual catalogues of Gartons Agricultural Plant Breeders from that firm's inception in 1898 until the first of their own varieties was introduced in 1909. In 1915, the British Sugar Beet Society was formed to create an example of a domestic sugar beet industry for the purpose of obtaining government financing. Twelve years later, in 1927, they succeeded. The sugar beet industry in the United Kingdom was finally subsidized providing stability to the domestic industry that had experienced volatile shifts in profits and losses in the years since 1915. References to the sugar manufacturing from beets in Russia are dating back to 1802. Jacob Esipov has built a first Russian commercial factory producing sugar from beets in the Tula province. During the Soviet period, some particularly impressive advancements were made in seed development, of which the most useful was the development of a frost-resistant sugar beet, further expanding the growing range of the sugar beet. The sugar beet, like sugarcane, needs a peculiar soil and a unique climate for its successful cultivation. The most important requirement is the soil must contain a large supply of plant food, be rich in humus, and have the property of retaining a great deal of moisture. A certain amount of alkali is not necessarily detrimental, as sugar beets are not especially susceptible to injury by some alkali. The ground should be fairly level and well-drained, especially where irrigation is practiced. While the physical character is of secondary importance, as generous crops are grown in sandy soil as well as in heavy loams, still the ideal soil is a sandy loam, i.e., a mixture of organic matter, clay and sand. A subsoil of gravel, or the presence of hard-pan, is not desirable, as cultivation to a depth of from 12 to 15 inches (30.5 to 38.1 cm) is necessary to produce the best results. Climatic conditions, temperature, sunshine, rainfall and winds have an important bearing upon the success of sugar beet agriculture. A temperature ranging from 15 to 21 °C (59.0 to 69.8 °F) during the growing months is most favorable. In the absence of adequate irrigation, 460 mm (18.1 inches) of rainfall are necessary to raise an average crop. High winds are harmful, as they generally crust the land and prevent the young beets from coming through the ground. The best results are obtained along the coast of southern California, where warm, sunny days succeeded by cool, foggy nights seem to meet sugar beet's favored growth conditions. Sunshine of long duration but not of great intensity is the most important factor in the successful cultivation of sugar beets. Near the equator, the shorter days and the greater heat of the sun sharply reduce the sugar content in the beet. To cultivate beets successfully, the land must be properly prepared. Deep ploughing is the first principle of beet culture. It allows the roots to penetrate the subsoil without much obstruction, thereby preventing the beet from growing out of the ground, besides enabling it to extract considerable nourishment and moisture from the lower soil. If the latter is too hard, the roots will not penetrate it readily and, as a result, the plant will be pushed up and out of the earth during the process of growth. A hard subsoil is impervious to water and prevents proper drainage. It should not be too loose, however, as this allows the water to pass through more freely than is desirable. Ideally, the soil should be deep, fairly fine and easily penetrable by the roots. It should also be capable of retaining moisture and at the same time admit of a free circulation of air and good drainage. Sugar beet crops exhaust the soil rapidly. Crop rotation is recommended and necessary. 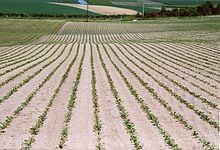 Normally, beets are grown in the same ground every third year, peas, beans or grain being raised the other two years. In most temperate climates, beets are planted in the spring and harvested in the autumn. At the northern end of its range, growing seasons as short as 100 days can produce commercially viable sugar beet crops. In warmer climates, such as in California's Imperial Valley, sugar beets are a winter crop, planted in the autumn and harvested in the spring. In recent years, Syngenta has developed the so-called tropical sugar beet. It allows the plant to grow in tropical and subtropical regions. Beets are planted from a small seed; 1 kg (2.2 lb) of beet seed comprises 100,000 seeds and will plant over one hectare (2.5 acres) of ground (one pound or 0.454 kilograms will plant about one acre or 0.40 hectares. Until the latter half of the 20th century, sugar beet production was highly labor-intensive, as weed control was managed by densely planting the crop, which then had to be manually thinned two or three times with a hoe during the growing season. Harvesting also required many workers. Although the roots could be lifted by a plough-like device which could be pulled by a horse team, the rest of the preparation was by hand. One laborer grabbed the beets by their leaves, knocked them together to shake free loose soil, and then laid them in a row, root to one side, greens to the other. A second worker equipped with a beet hook (a short-handled tool between a billhook and a sickle) followed behind, and would lift the beet and swiftly chop the crown and leaves from the root with a single action. Working this way, he would leave a row of beets that could be forked into the back of a cart. Today, mechanical sowing, herbicide application for weed control, and mechanical harvesting have displaced this reliance on manual farm work. A root beater uses a series of blades to chop the leaf and crown (which is high in nonsugar impurities) from the root. The beet harvester lifts the root, and removes excess soil from the root in a single pass over the field. A modern harvester is typically able to cover six rows at the same time. The beets are dumped into trucks as the harvester rolls down the field, and then delivered to the factory. The conveyor then removes more soil. If the beets are to be left for later delivery, they are formed into clamps. Straw bales are used to shield the beets from the weather. Provided the clamp is well built with the right amount of ventilation, the beets do not significantly deteriorate. Beets that freeze and then defrost, produce complex carbohydrates that cause severe production problems in the factory. In the UK, loads may be hand examined at the factory gate before being accepted. In the US, the fall harvest begins with the first hard frost, which arrests photosynthesis and the further growth of the root. Depending on the local climate, it may be carried out over the course of a few weeks or be prolonged throughout the winter months. The harvest and processing of the beet is referred to as "the campaign", reflecting the organization required to deliver the crop at a steady rate to processing factories that run 24 hours a day for the duration of the harvest and processing (for the UK, the campaign lasts about five months). In the Netherlands, this period is known as de bietencampagne, a time to be careful when driving on local roads in the area while the beets are being grown, because the naturally high clay content of the soil tends to cause slippery roads when soil falls from the trailers during transport. The world harvested 250,191,362 metric tons (246,200,000 long tons; 275,800,000 short tons) of sugar beets in 2013. The world's largest producer was the United States, with a 39,321,161 metric tons (38,700,000 long tons; 43,300,000 short tons) harvest. The average yield of sugar beet crops worldwide was 58.2 tonnes per hectare. The most productive sugar beet farms in the world, in 2010, were in Chile, with a nationwide average yield of 87.3 tonnes per hectare. Imperial Valley (California) farmers have achieved yields of about 160 tonnes per hectare and over 26 tonnes sugar per hectare. Imperial Valley farms benefit from high intensities of incident sunlight and intensive use of irrigation and fertilizers. The sugar industry in the EU came under bureaucratic pressure in 2006 and ultimately resulted in the loss of 20,000 jobs, although many factories, as detailed in a later 2010 EU audit, were found to have been mistakenly shut down, as they were profitable without government intervention. Western Europe, and Eastern Europe did not produce enough sugar from sugar beets to meet overall demand for sugar in 2010–2011, and were net importers of sugar. After they are harvested, beets are typically transported to a factory. In the UK, beets are transported by a hauler, or by a tractor and a trailer by local farmers. Railways and boats are no longer used. Some beets were carried by rail in the Republic of Ireland, until the complete shutdown of Irish Sugar beet production in 2006.
nitrogen content – for recommending future fertilizer use to the farmer. 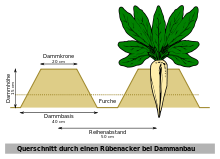 Diffusers are long vessels of many metres in which the beet slices go in one direction while hot water goes in the opposite direction. The movement may either be caused by a rotating screw or the whole rotating unit, and the water and cossettes move through internal chambers. The three common designs of diffuser are the horizontal rotating 'RT' (Raffinerie Tirlemontoise, manufacturer), inclined screw 'DDS' (De Danske Sukkerfabrikker), or vertical screw "Tower". Modern tower extraction plants have a processing capacity of up to 17,000 metric tons (16,700 long tons; 18,700 short tons) per day. A less-common design uses a moving belt of cossettes, with water pumped onto the top of the belt and poured through. In all cases, the flow rates of cossettes and water are in the ratio one to two. Typically, cossettes take about 90 minutes to pass through the diffuser, the water only 45 minutes. These countercurrent exchange methods extract more sugar from the cossettes using less water than if they merely sat in a hot water tank. The liquid exiting the diffuser is called raw juice. The colour of raw juice varies from black to a dark red depending on the amount of oxidation, which is itself dependent on diffuser design. The used cossettes, or pulp, exit the diffuser at about 95% moisture, but low sucrose content. 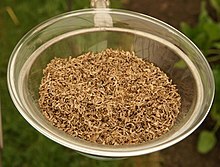 Using screw presses, the wet pulp is then pressed down to 75% moisture. This recovers additional sucrose in the liquid pressed out of the pulp, and reduces the energy needed to dry the pulp. The pressed pulp is dried and sold as animal feed, while the liquid pressed out of the pulp is combined with the raw juice, or more often introduced into the diffuser at the appropriate point in the countercurrent process. The final byproduct, vinasse, is used as fertilizer or growth substrate for yeast cultures. During diffusion, a portion of the sucrose breaks down into invert sugars. These can undergo further breakdown into acids. These breakdown products are not only losses of sucrose, but also have knock-on effects reducing the final output of processed sugar from the factory. To limit (thermophilic) bacterial action, the feed water may be dosed with formaldehyde and control of the feed water pH is also practiced. Attempts at operating diffusion under alkaline conditions have been made, but the process has proven problematic. The improved sucrose extraction in the diffuser is offset by processing problems in the next stages. Carbonatation is a procedure which removes impurities from raw juice before it undergoes crystallization. First, the juice is mixed with hot milk of lime (a suspension of calcium hydroxide in water). This treatment precipitates a number of impurities, including multivalent anions such as sulfate, phosphate, citrate and oxalate, which precipitate as their calcium salts and large organic molecules such as proteins, saponins and pectins, which aggregate in the presence of multivalent cations. In addition, the alkaline conditions convert the simple sugars, glucose and fructose, along with the amino acid glutamine, to chemically stable carboxylic acids. Left untreated, these sugars and amines would eventually frustrate crystallization of the sucrose. The thin juice is concentrated via multiple-effect evaporation to make a thick juice, roughly 60% sucrose by weight and similar in appearance to pancake syrup. Thick juice can be stored in tanks for later processing, reducing the load on the crystallization plant. Thick juice is fed to the crystallizers. Recycled sugar is dissolved into it, and the resulting syrup is called mother liquor. The liquor is concentrated further by boiling under a vacuum in large vessels (the so-called vacuum pans) and seeded with fine sugar crystals. These crystals grow as sugar from the mother liquor forms around them. The resulting sugar crystal and syrup mix is called a massecuite, from "cooked mass" in French. The massecuite is passed to a centrifuge, where the High Green syrup is removed from the massecuite by centrifugal force. After a predetermined time, water is then sprayed into the centrifuge via a spray bar to wash the sugar crystals which produces Low Green syrup. The centrifuge then spins at very high speed to partially dry the crystals the machine then slows down and a plough shaped arm is deployed which ploughs out the sugar from the sides of the centrifuge from the top to the bottom onto conveying plant underneath where it is transported into a rotating granulator where it is dried using warm air. The high green syrup is fed to a raw sugar vacuum pan from which a second batch of sugar is produced. This sugar ("raw") is of lower quality with more colour and impurities, and is the main source of the sugar dissolved again into the mother liquor. The syrup from the raw (Low green syrup) is boiled for a long time in AP Pans and sent to slowly flow around a series of about eight crystallisers. From this, a very low-quality sugar crystal is produced (known in some systems as "AP sugar") that is also redissolved. The syrup separated is molasses, which still contains sugar, but contains too much impurity to undergo further processing economically. The molasses is stored on site and is added to dried beet pulp to make animal feed. Some is also sold in bulk tankers. Actual procedures may vary from the above description, with different recycling and crystallisation processes. In a number of countries, notably the Czech Republic and Slovakia, beet sugar is used to make a rum-like distilled spirit called Tuzemak. On the Åland Islands, a similar drink is made under the brand name Kobba Libre. In some European countries, especially in the Czech Republic and Germany, beet sugar is also used to make rectified spirit and vodka. An unrefined sugary syrup is produced directly from the sugar beet. This thick, dark syrup is produced by cooking shredded sugar beet for several hours, then pressing the resulting mash and concentrating the juice produced until it has a consistency similar to that of honey and in the Czech Republic, beet sugar is used to make a rum-like distilled spirit all Czechs know as their rum, an alcoholic beverage called Tuzemák, formerly called Tuzemský rum (English: domestic rum). An unrefined sugary syrup can be produced directly from sugar beet. This thick, dark syrup is produced by cooking shredded sugar beet for several hours, then pressing the resulting mash and concentrating the juice produced until it has a consistency similar to that of honey. No other ingredients are used. In Germany, particularly the Rhineland area, this sugar beet syrup (called Zuckerrüben-Sirup or Zapp in German) is used as a spread for sandwiches, as well as for sweetening sauces, cakes and desserts. Commercially, if the syrup has a dextrose equivalency (DE) above 30, the product has to be hydrolyzed and converted to a high-fructose syrup, much like high-fructose corn syrup, or isoglucose syrup in the EU. Many road authorities in North America use desugared beet molasses as de-icing or anti-icing products in winter control operations. The molasses can be used directly, combined with liquid chlorides and applied to road surfaces, or used to treat the salt spread on roads. Molasses can be more advantageous than road salt alone because it reduces corrosion and lowers the freezing point of the salt-brine mix, so the de-icers remain effective at lower temperatures. The addition of the liquid to rock salt has the additional benefits that it reduces the bounce and scatter of the rock salt, keeping it where it is needed, and reduces the activation time of the salt to begin the melting process. Betaine can be isolated from the byproducts of sugar beet processing. Production is chiefly through chromatographic separation, using techniques such as the "simulated moving bed". Uridine can be isolated from sugar beet. BP and Associated British Foods plan to use agricultural surpluses of sugar beet to produce biobutanol in East Anglia in the United Kingdom. The feedstock-to-yield ratio for sugarbeet is 56:9. Therefore, it takes 6.22 kg of sugar beet to produce 1 kg of ethanol (approximately 1.27 l at room temperature). Sugar beets are an important part of a crop rotation cycle. Sugar beet plants are susceptible to Rhizomania ("root madness"), which turns the bulbous tap root into many small roots, making the crop economically unprocessable. Strict controls are enforced in European countries to prevent the spread, but it is already endemic in some areas. It is also susceptible to the beet leaf curl virus, which causes crinkling and stunting of the leaves. Continual research looks for varieties with resistance, as well as increased sugar yield. 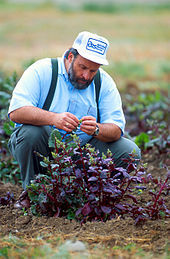 Sugar beet breeding research in the United States is most prominently conducted at various USDA Agricultural Research Stations, including one in Fort Collins, Colorado, headed by Linda Hanson and Leonard Panella; one in Fargo, North Dakota, headed by John Wieland; and one at Michigan State University in East Lansing, Michigan, headed by J. Mitchell McGrath. In the United States, genetically modified sugar beets, engineered for resistance to glyphosate, a herbicide marketed as Roundup, were developed by Monsanto as a genetically modified crop. In 2005, the US Department of Agriculture-Animal and Plant Health Inspection Service (USDA-APHIS) deregulated glyphosate-resistant sugar beets after it conducted an environmental assessment and determined glyphosate-resistant sugar beets were highly unlikely to become a plant pest. Sugar from glyphosate-resistant sugar beets has been approved for human and animal consumption in multiple countries, but commercial production of biotech beets has been approved only in the United States and Canada. Studies have concluded the sugar from glyphosate-resistant sugar beets has the same nutritional value as sugar from conventional sugar beets. After deregulation in 2005, glyphosate-resistant sugar beets were extensively adopted in the United States. About 95% of sugar beet acres in the US were planted with glyphosate-resistant seed in 2011. Weeds may be chemically controlled using glyphosate without harming the crop. After planting sugar beet seed, weeds emerge in fields and growers apply glyphosate to control them. Glyphosate is commonly used in field crops because it controls a broad spectrum of weed species and has a low toxicity. A study from the UK suggests yields of genetically modified beet were greater than conventional, while another from the North Dakota State University extension service found lower yields. The introduction of glyphosate-resistant sugar beets may contribute to the growing number of glyphosate-resistant weeds, so Monsanto has developed a program to encourage growers to use different herbicide modes of action to control their weeds. 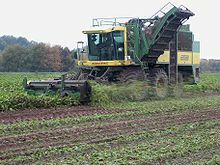 In 2008, the Center for Food Safety, the Sierra Club, the Organic Seed Alliance and High Mowing Seeds filed a lawsuit against USDA-APHIS regarding their decision to deregulate glyphosate-resistant sugar beets in 2005. The organizations expressed concerns regarding glyphosate-resistant sugar beets' ability to potentially cross-pollinate with conventional sugar beets. U.S. District Judge Jeffrey S. White, US District Court for the Northern District of California, revoked the deregulation of glyphosate-resistant sugar beets and declared it unlawful for growers to plant glyphosate-resistant sugar beets in the spring of 2011. Believing a sugar shortage would occur USDA-APHIS developed three options in the environmental assessment to address the concerns of environmentalists. In 2011, a federal appeals court for the Northern district of California in San Francisco overturned the ruling. In July 2012, after completing an environmental impact assessment and a plant pest risk assessment the USDA deregulated Monsanto's Roundup Ready sugar beets. The sugar beet genome has been sequenced and two reference genome sequences have already been generated. The genome size of the sugar beet is approximately 731 Megabases, and sugar beet DNA is packaged in 18 metacentric chromosomes (2n=2x=18). All sugar beet centromeres are made up of a single satellite DNA family and centromere-specific LTR retrotransposons. More than 60 % of sugar beet's DNA is repetitive, mostly distributed in a dispersed way along the chromosomes. Crop wild beet populations (B. vulgaris ssp. maritima) have been sequenced as well, allowing for identification of the resistance gene Rz2 in the wild progenitor. Rz2 confers resistance to rhizomania, commonly known as the sugar beet root madness disease. ^ Beta Maritima: The Origin of Beets. Springer. 2012. ISBN 978-1-4614-0841-3. The volume will be completely devoted to the sea beet, that is, the ancestor of all the cultivated beets. The wild plant, growing mainly on the shore of the Mediterranean Sea, remains very important as source of useful traits for beet breeding. ^ a b c "Statistics". Food and Agriculture Organization. Archived from the original on 2011-07-13. ^ a b "Sugar:World Markets and Trade" (PDF). United States Department of Agriculture: FAS Information. 2011. ^ "NASS – Statistics by Subject – Crops & Plants – Field Crops – Sugarbeets". United States Department of Agriculture. Archived from the original on 2006-10-03. ^ a b "Agribusiness Handbook: Sugar beet white sugar" (PDF). Food and Agriculture Organization, United Nations. 2009. ^ "Agribusiness Handbooks, vol. 4: Sugar Beets / White Sugar" (PDF). 1999. ^ a b c d e f George Rolph (1873). Something about sugar: its history, growth, manufacture and distribution. San Francisco, J. J. Newbegin. ^ a b c d e Hill, G.; Langer, R. H. M. (1991). Agricultural plants. Cambridge, UK: Cambridge University Press. pp. 197–199. ISBN 978-0-521-40563-8. ^ a b c d e f Hanelt, Peter; Büttner, R.; Mansfeld, Rudolf; Kilian, Ruth (2001). Mansfeld's Encyclopedia of Agricultural and Horticultural Crops. Springer. pp. 235–241. ISBN 978-3-540-41017-1. ^ Experiences chimiques faites dans le dessein de tirer un veritable sucre de diverses plantes, qui croissent dans nos contrées (Chemical experiments made with the intention of extracting real sugar from diverse plants that grow in our lands). Histoire de l'académie royale des sciences et belles-lettres de Berlin. Marggraf (1747). 1749. pp. 79–90. ^ a b c d e f g Dowling, R. N. (1928). Sugar Beet and Beet Sugar. London: Ernest Benn Limited. ^ L'Illustration Journal Universel, 13 May 1843. ^ Poggi, E. Muriel (1930). "The German Sugar Beet Industry". Economic Geography. 2. 6 (1): 81–93. doi:10.2307/140639. JSTOR 140639. ^ Kenneth Kiple; Kriemhild Conee Ornelas. "The Cambridge World History of Food". Retrieved April 1, 2014. ^ "All About Rum". Tastings.com. Retrieved April 1, 2014. ^ a b c Kaufman, Cathy K. (2008). "Salvation in Sweetness? Sugar Beets in Antebellum America". Vegetables: Proceedings of the Oxford Symposium on Food and Cookery: 95–104. The problems with free sugar, as with most of the free labor products, were both quantitative and qualitative: free labor sugar was hard to come by, was more expensive than slave sugar, and worst of all, tasted awful. ^ a b Robert M. Harveson. "History of Sugar Beet Production and Use". University of Nebraska. Retrieved April 1, 2014. ^ a b Magnuson, Torsten A. (1918). "History of the Beet Sugar Industry in California". Annual Publication of the Historical Society of Southern California. 11 (1): 68–79. doi:10.2307/41168761. JSTOR 41168761. ^ Arrington, Leonard J. (1966). Beet sugar in the West; a history of the Utah-Idaho Sugar Company, 1891–1966. University of Washington Press. OCLC 234150. ^ Godfrey, Matthew C. (2007). Religion, politics, and sugar: the Mormon Church, the federal government, and the Utah-Idaho Sugar Company, 1907-1921. All Usu Press Publications. Logan, Utah: Utah State University Press. ISBN 978-0-87421-658-5. OCLC 74988178. ^ Taussig, F. W. (1912). "Beet Sugar and the Tariff". The Quarterly Journal of Economics. 2. 26 (2): 189–214. doi:10.2307/1884763. JSTOR 1884763. ^ Fiset, Louis (1999). "Thinning, Topping, and Loading: Japanese Americans and Beet Sugar in World War II". The Pacific Northwest Quarterly. 3. 90: 123–139. ^ "History of sugarbeets". 2015-09-25. ^ "The North American Sugar Market". ^ "History of sugar production"
^ Buzanov, I. F. (1967). "Scientific and Technical Progress in Beet Growing". Vestnik Sel'skokhozyaystvennoy Nauki. 13: 21–26. ^ "De-icing Highways and Roads Using Sugar Beet Juice". Yahoo!. ^ "FAOSTAT: Production, Crops, Sugar beet, 2010 data". Food and Agriculture Organization. 2011. Archived from the original on 2013-01-14. ^ Limb Re (2008). "THE EFFECTIVE COMMUNICATION OF AGRICULTURAL R&D OUTPUT IN THE UK BEET SUGAR INDUSTRY" (PDF). Proc South African Sugar Technology Association. 81: 107���115. ^ "Attention to detail critical in meeting beet yield targets". Farmers Guardian. June 2010. ^ "Greencore sugar plant closure unnecessary? - RTÉ News". Rte.ie. Rte.ie. 2010-11-10. Retrieved 2012-12-22. ^ "article on tower diffusers". Archived from the original on 11 May 2013. Retrieved 24 June 2010. ^ KOYIKKAL, SRIKUMAR (2013-04-08). Chemical Process Technology and Simulation (in Arabic). PHI Learning Pvt. Ltd. ISBN 9788120347090. ^ "Czechs and Their Billion Dollar Beets". Tres Bohemes. 2017-02-09. Retrieved 2018-04-15. ^ a b Sarah Morrison (May 23, 2008). "That beet is sweet!" (PDF). Statistics Canada. Archived from the original (PDF) on July 6, 2011. ^ a b Peter S. Carlton (2009). "De-icing Roads with De-sugared Beet Molassis(sic)". CAS Communications. ^ Monsanto. "Roundup Ready Sugarbeets". ^ "Roundup Ready® Sugar Beet Case – Timeline". APHIS. Archived from the original on 2010-10-17. ^ a b "United States Court of Appeals for the Ninth Circuit. No. 10-17719, D.C. No. 3:10-cv-04038-JSW" (PDF). 25 February 2011. Archived from the original (PDF) on 16 October 2013. Retrieved 28 August 2012. ^ "Brief 43-2011. Executive Summary: Global Status of Commercialized Biotech/GM Crops: 2011". ISAAA. Archived from the original on 2012-02-10. ^ Michigan Sugar Company. "2010 Growers' Guide for Producing Quality Sugarbeets". ^ Stephen O Duke & Stephen B Powles (2008). "Glyphosate: a once-in-a-century herbicide: Mini-review". Pest Management Science Pest Manag Sci 64:319–325. ^ May, MJ; et al. (2005). "Management of genetically modified herbicide-tolerant sugar beet for spring and autumn environmental benefit". Proc Biol Sci. 27 (1559): 111–119. doi:10.1098/rspb.2004.2948. PMC 1634958. PMID 15695200. ^ Mike Abrams (6 February 2009). "Roundup Ready Crops Prove to be a Hit in the USA". Farmers Weekly. Archived from the original on 2011-11-24. ^ "Press Release: Monsanto Outlines New Weed Management Platform Under the Roundup Ready PLUS™ Brand". monsanto. Oct 19, 2010. Archived from the original on June 22, 2012. ^ a b USDA-APHIS (February 4, 2011). "Roundup Ready Sugar Beet Case: Timeline". Archived from the original on 2013-07-01. ^ USDA-APHIS (January 29, 2009). "Environmental Compliance". Archived from the original on October 6, 2014. ^ USDA-APHIS. "USDA Prepares Draft Environmental Assessment on Regulatory Options for Roundup Ready Sugar Beets". Archived from the original on 2010-11-06. ^ "Roundup Ready® Sugar Beet News". USDA Animal and Plant Health Inspection Service. 7 August 2012. Archived from the original on 13 October 2010. Retrieved 28 July 2012. ^ Dohm, Juliane C.; Minoche, André E.; Holtgräwe, Daniela; Capella-Gutiérrez, Salvador; Zakrzewski, Falk; Tafer, Hakim; Rupp, Oliver; Sörensen, Thomas Rosleff; Stracke, Ralf (2013-12-18). "The genome of the recently domesticated crop plant sugar beet (Beta vulgaris)". Nature. 505 (7484): 546–549. doi:10.1038/nature12817. ISSN 0028-0836. PMID 24352233. ^ Funk, Andrew; Galewski, Paul; McGrath, J. Mitchell (2018). "Nucleotide-binding resistance gene signatures in sugar beet, insights from a new reference genome". The Plant Journal. 95 (4): 659–671. doi:10.1111/tpj.13977. ISSN 1365-313X. PMID 29797366. ^ Paesold, Susanne; Borchardt, Dietrich; Schmidt, Thomas; Dechyeva, Daryna (2012-09-07). "A sugar beet (Beta vulgarisL.) reference FISH karyotype for chromosome and chromosome-arm identification, integration of genetic linkage groups and analysis of major repeat family distribution". The Plant Journal. 72 (4): 600–611. doi:10.1111/j.1365-313x.2012.05102.x. ISSN 0960-7412. PMID 22775355. ^ Weber, Beatrice; Heitkam, Tony; Holtgräwe, Daniela; Weisshaar, Bernd; Minoche, André E.; Dohm, Juliane C.; Himmelbauer, Heinz; Schmidt, Thomas (2013-03-01). "Highly diverse chromoviruses of Beta vulgaris are classified by chromodomains and chromosomal integration". Mobile DNA. 4 (1): 8. doi:10.1186/1759-8753-4-8. ISSN 1759-8753. PMC 3605345. PMID 23448600. ^ Weber, Beatrice; Wenke, Torsten; Frömmel, Ulrike; Schmidt, Thomas; Heitkam, Tony (2010-02-01). "The Ty1-copia families SALIRE and Cotzilla populating the Beta vulgaris genome show remarkable differences in abundance, chromosomal distribution, and age". Chromosome Research. 18 (2): 247–263. doi:10.1007/s10577-009-9104-4. ISSN 1573-6849. PMID 20039119. ^ Wollrab, Cora; Heitkam, Tony; Holtgräwe, Daniela; Weisshaar, Bernd; Minoche, André E.; Dohm, Juliane C.; Himmelbauer, Heinz; Schmidt, Thomas (2012). "Evolutionary reshuffling in the Errantivirus lineage Elbe within the Beta vulgaris genome". The Plant Journal. 72 (4): 636–651. doi:10.1111/j.1365-313X.2012.05107.x. ISSN 1365-313X. PMID 22804913. ^ Heitkam, Tony; Schmidt, Thomas (2009). "BNR – a LINE family from Beta vulgaris– contains a RRM domain in open reading frame 1 and defines a L1 sub-clade present in diverse plant genomes". The Plant Journal. 59 (6): 872–882. doi:10.1111/j.1365-313X.2009.03923.x. ISSN 1365-313X. PMID 19473321. ^ Schwichtenberg, Katrin; Wenke, Torsten; Zakrzewski, Falk; Seibt, Kathrin M.; Minoche, André; Dohm, Juliane C.; Weisshaar, Bernd; Himmelbauer, Heinz; Schmidt, Thomas (2016). "Diversification, evolution and methylation of short interspersed nuclear element families in sugar beet and related Amaranthaceae species". The Plant Journal. 85 (2): 229–244. doi:10.1111/tpj.13103. ISSN 1365-313X. PMID 26676716. ^ Capistrano-Gossmann, Gina G.; Ries, D.; Holtgräwe, D.; Minoche, A.; Kraft, T.; Frerichmann, S.L.M. ; Rosleff Soerensen, T.; Dohm, J. C.; González, I. (2017-06-06). "Crop wild relative populations of Beta vulgaris allow direct mapping of agronomically important genes". Nature Communications. 8: 15708. doi:10.1038/ncomms15708. PMC 5467160. PMID 28585529. Wikimedia Commons has media related to Sugar beets. 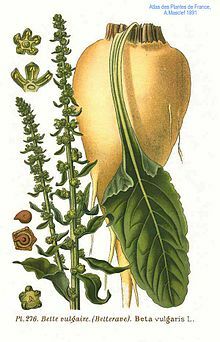 Look up sugar beet in Wiktionary, the free dictionary.